This article is about the borough in New York City. For other uses, see Brooklyn (disambiguation). Brooklyn (/ˈbrʊklɪn/) is the most populous borough of New York City, with an estimated 2,648,771 residents in 2017. Named after the Dutch village of Breukelen, it borders the borough of Queens at the western end of Long Island. Brooklyn has several bridge and tunnel connections to the borough of Manhattan across the East River, and the Verrazzano-Narrows Bridge connects it with Staten Island. Since 1896, Brooklyn has been coterminous with Kings County, the most populous county in the U.S. state of New York and the second-most densely populated county in the United States, after New York County (which is coextensive with the borough of Manhattan). 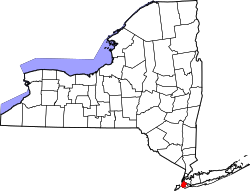 With a land area of 71 square miles (180 km2) and water area of 26 square miles (67 km2), Kings County is New York state's fourth-smallest county by land area and third-smallest by total area, though it is the second-largest among the city's five boroughs. Today, if each borough were ranked as a city, Brooklyn would rank as the third-most populous in the U.S., after Los Angeles and Chicago. Brooklyn was an independent incorporated city (and previously an authorized village and town within the provisions of the New York State Constitution) until January 1, 1898, when, after a long political campaign and public relations battle during the 1890s, according to the new Municipal Charter of "Greater New York", Brooklyn was consolidated with the other cities, boroughs, and counties to form the modern City of New York, surrounding the Upper New York Bay with five constituent boroughs. The borough continues, however, to maintain a distinct culture. Many Brooklyn neighborhoods are ethnic enclaves. Brooklyn's official motto, displayed on the Borough seal and flag, is Eendraght Maeckt Maght, which translates from early modern Dutch as "Unity makes strength". In the first decades of the 21st century, Brooklyn has experienced a renaissance as an avant garde destination for hipsters, with concomitant gentrification, dramatic house price increases, and a decrease in housing affordability. Since the 2010s, Brooklyn has evolved into a thriving hub of entrepreneurship and high technology startup firms, and of postmodern art and design. The name Brooklyn is derived from the original Dutch colonial name Breuckelen, meaning marshland. Established in 1646, the name first appeared in print in 1663. The Dutch colonists named it after the scenic town of Breukelen, Netherlands. Over the past two millennia, the name of the ancient town in Holland has been Bracola, Broccke, Brocckede, Broiclede, Brocklandia, Broekclen, Broikelen, Breuckelen and finally Breukelen. The New Amsterdam settlement of Breuckelen also went through many spelling variations, including Breucklyn, Breuckland, Brucklyn, Broucklyn, Brookland, Brockland, Brocklin, and Brookline/Brook-line. There have been so many variations of the name that its origin has been debated; some have claimed breuckelen means "broken land." The final name of Brooklyn, however, is the most accurate to its meaning. The history of European settlement in Brooklyn spans more than 350 years. The settlement began in the 17th century as the small Dutch-founded town of "Breuckelen" on the East River shore of Long Island, grew to be a sizeable city in the 19th century, and was consolidated in 1898 with New York City (then confined to Manhattan and part of the Bronx), the remaining rural areas of Kings County, and the largely rural areas of Queens and Staten Island, to form the modern City of New York. The etymology of Breuckelen may be directly from the dialect word Breuckelen meaning buckle or from the Plattdeutsch Brücken meaning bridge. Brooklyn Heights: as Breuckelen in 1646, after the town now spelled Breukelen, Netherlands. Breuckelen was located along Fulton Street (now Fulton Mall) between Hoyt Street and Smith Street (according to H. Stiles and P. Ross). Brooklyn Heights, or Clover Hill, is where the village Brooklyn was founded in 1816. A typical dining table in the Dutch village of Brooklyn, c. 1664, from The Brooklyn Museum. The colony's capital of New Amsterdam, across the East River, obtained its charter in 1653, later than the village of Brooklyn. The neighborhood of Marine Park was home to North America's first tide mill. It was built by the Dutch, and the foundation can be seen today. But the area was not formally settled as a town. Many incidents and documents relating to this period are in Gabriel Furman's 1824 compilation. What is Brooklyn today left Dutch hands after the final English conquest of New Netherland in 1664, a prelude to the Second Anglo–Dutch War. New Netherland was taken in a naval action, and the conquerors renamed their prize in honor of the overall English naval commander, James, Duke of York, brother of the then monarch King Charles II of England and future king himself as King James II of England and James VII of Scotland; Brooklyn became a part of the new English and later British colony, the Province of New York. The English reorganized the six old Dutch towns on southwestern Long Island as Kings County on November 1, 1683, one of the "original twelve counties" then established in New York Province. This tract of land was recognized as a political entity for the first time, and the municipal groundwork was laid for a later expansive idea of Brooklyn identity. Lacking the patroon and tenant farmer system established along the Hudson River Valley, this agricultural county unusually came to have one of the highest percentages of slavery among the population in the "Original Thirteen Colonies" along the Atlantic Ocean eastern coast of North America. The Battle of Long Island was fought across Kings County. On August 27, 1776, was fought the Battle of Long Island (also known as the 'Battle of Brooklyn'), the first major engagement fought in the American Revolutionary War after independence was declared, and the largest of the entire conflict. British troops forced Continental Army troops under George Washington off the heights near the modern sites of Green-Wood Cemetery, Prospect Park, and Grand Army Plaza. Washington, viewing particularly fierce fighting at the Gowanus Creek from atop a hill near the west end of present-day Atlantic Avenue, was famously reported to have emotionally exclaimed: "What brave men I must this day lose!". The fortified American positions at Brooklyn Heights consequently became untenable and were evacuated a few days later, leaving the British in control of New York Harbor. While Washington's defeat on the battlefield cast early doubts on his ability as the commander, the tactical withdrawal of all his troops and supplies across the East River in a single night is now seen by historians as one of his most brilliant triumphs. The British controlled the surrounding region for the duration of the war, as New York City was soon occupied and became their military and political base of operations in North America for the remainder of the conflict. The British generally enjoyed a dominant Loyalist sentiment from the residents in Kings County who did not evacuate, though the region was also the center of the fledgling—and largely successful—American intelligence network, headed by Washington himself. The British set up a system of notorious prison ships off the coast of Brooklyn in Wallabout Bay, where more American patriots died of intentional neglect than died in combat on all the battlefields of the American Revolutionary War, combined. One result of the Treaty of Paris in 1783 was the evacuation of the British from New York City, celebrated by residents into the 20th century. A preindustrial Winter Scene in Brooklyn, c. 1819–20, by Francis Guy (Brooklyn Museum). The first half of the 19th century saw the beginning of the development of urban areas on the economically strategic East River shore of Kings County, facing the adolescent City of New York confined to Manhattan Island. The New York Navy Yard operated in Wallabout Bay (border between Brooklyn and Williamsburgh) for the entire 19th century and two-thirds of the 20th century. The first center of urbanization sprang up in the Town of Brooklyn, directly across from Lower Manhattan, which saw the incorporation of the Village of Brooklyn in 1817. Reliable steam ferry service across the East River to Fulton Landing converted Brooklyn Heights into a commuter town for Wall Street. Ferry Road to Jamaica Pass became Fulton Street to East New York. Town and Village were combined to form the first, kernel incarnation of the City of Brooklyn in 1834. In parallel development, the Town of Bushwick, a little farther up the river, saw the incorporation of the Village of Williamsburgh in 1827, which separated as the Town of Williamsburgh in 1840 and formed the short-lived City of Williamsburgh in 1851. Industrial deconcentration in mid-century was bringing shipbuilding and other manufacturing to the northern part of the county. Each of the two cities and six towns in Kings County remained independent municipalities, and purposely created non-aligning street grids with different naming systems. However, the East River shore was growing too fast for the three-year-old infant City of Williamsburgh; it, along with its Town of Bushwick hinterland, was subsumed within a greater City of Brooklyn in 1854. By 1841, with the appearance of The Brooklyn Eagle, and Kings County Democrat published by Alfred G. Stevens, the growing city across the East River from Manhattan was producing its own prominent newspaper. It later became the most popular and highest circulation afternoon paper in America. The publisher changed to L. Van Anden on April 19, 1842, and the paper was renamed The Brooklyn Daily Eagle and Kings County Democrat on June 1, 1846. On May 14, 1849, the name was shortened to The Brooklyn Daily Eagle; on September 5, 1938, it was further shortened to Brooklyn Eagle. The establishment of the paper in the 1840s helped develop a separate identity for Brooklynites over the next century. The borough's soon-to-be-famous National League baseball team, the Brooklyn Dodgers, also assisted with this. Both major institutions were lost in the 1950s: the paper closed in 1955 after unsuccessful attempts at a sale following a reporters' strike, and the baseball team decamped for Los Angeles in a realignment of major league baseball in 1957. Agitation against Southern slavery was stronger in Brooklyn than in New York, and under Republican leadership the city was fervent in the Union cause in the Civil War. After the war the Henry Ward Beecher Monument was built downtown to honor a famous local abolitionist. A great victory arch was built at what was then the south end of town to celebrate the armed forces; this place is now called Grand Army Plaza. The city had a population of 25,000 in 1834, but the police department comprised only 12 men on the day shift and another 12 at night. Every time a rash of burglaries broke out, officials blamed burglars coming in from New York City. Finally in 1855, a modern police force was created, employing 150 men. Voters complained of inadequate protection and excessive costs. In 1857, the state legislature merged the Brooklyn force with that of New York City. Fervent in the Union cause, the city of Brooklyn played a major role in supplying troops and materiel for the American Civil War. The most well-known regiment to be sent off to war from the city was the 14th Brooklyn "Red Legged Devils". They fought from 1861 to 1864, wore red the entire war, and were the only regiment named after a city; President Lincoln called them into service personally, making them part of a handful of three-year enlisted soldiers in April 1861. Unlike other regiments during the American Civil War, the 14th wore a uniform inspired by that of the French Chasseurs, a light infantry used for quick assaults on the enemy. As both a seaport and a manufacturing center, Brooklyn was well prepared to contribute to the Union's strengths in shipping and manufacturing. The two combined in shipbuilding; the ironclad Monitor was built in Brooklyn. Brooklyn is referred to as a twin city of New York in the 1883 poem, "The New Colossus" by Emma Lazarus, which appears on a plaque inside the Statue of Liberty. The poem calls New York Harbor "the air-bridged harbor that twin cities frame". As a twin city to New York, it played a role in national affairs that was later overshadowed by its century-old submergence into its old partner and rival. Economic growth continued, propelled by immigration and industrialization, and Brooklyn established itself as the third-most populous American city for much of the 19th century. The waterfront from Gowanus Bay to Greenpoint was developed with piers and factories. Industrial access to the waterfront was improved by the Gowanus Canal and the canalized Newtown Creek. The USS Monitor was only the most famous product of the large and growing shipbuilding industry of Williamsburg. After the Civil War, trolley lines and other transport brought urban sprawl beyond Prospect Park and into the center of the county. The rapidly growing population needed more water, so the City built centralized waterworks including the Ridgewood Reservoir. The municipal Police Department, however, was abolished in 1854 in favor of a Metropolitan force covering also New York and Westchester Counties. In 1865 the Brooklyn Fire Department (BFD) also gave way to the new Metropolitan Fire District. Throughout this period the peripheral towns of Kings County, far from Manhattan and even from urban Brooklyn, maintained their rustic independence. The only municipal change seen was the secession of the eastern section of the Town of Flatbush as the Town of New Lots in 1852. The building of rail links such as the Brighton Beach Line in 1878 heralded the end of this isolation. Sports became big business, and the Brooklyn Bridegrooms played professional baseball at Washington Park in the convenient suburb of Park Slope and elsewhere. Early in the next century, under their new name of Brooklyn Dodgers, they brought baseball to Ebbets Field, beyond Prospect Park. Racetracks, amusement parks, and beach resorts opened in Brighton Beach, Coney Island, and elsewhere in the southern part of the county. Currier and Ives print of Brooklyn, 1886. Toward the end of the 19th century, the City of Brooklyn experienced its final, explosive growth spurt. Railroads and industrialization spread to Bay Ridge and Sunset Park. In the space of a decade, the city annexed the Town of New Lots in 1886, the Town of Flatbush, the Town of Gravesend, the Town of New Utrecht in 1894, and the Town of Flatlands in 1896. Brooklyn had reached its natural municipal boundaries at the ends of Kings County. Brooklyn elected a mayor from 1834 until consolidation in 1898 into the City of Greater New York, whose own second mayor (1902–1903), Seth Low, had been Mayor of Brooklyn from 1882 to 1885. Since 1898, Brooklyn has, in place of a separate mayor, elected a Borough President. In 1883, the Brooklyn Bridge was completed, transportation to Manhattan was no longer by water only, and the City of Brooklyn's ties to the City of New York were strengthened. The question became whether Brooklyn was prepared to engage in the still-grander process of consolidation then developing throughout the region, whether to join with the county of New York, the county of Richmond and the western portion of Queens County to form the five boroughs of a united City of New York. Andrew Haskell Green and other progressives said Yes, and eventually they prevailed against the Daily Eagle and other conservative forces. In 1894, residents of Brooklyn and the other counties voted by a slight majority to merge, effective in 1898. Kings County retained its status as one of New York State's counties, but the loss of Brooklyn's separate identity as a city was met with consternation by some residents at the time. The merger was called the "Great Mistake of 1898" by many newspapers of the day, and the phrase still denotes Brooklyn pride among old-time Brooklynites. Brooklyn totals 97 square miles (250 km2) in area, of which 71 square miles (180 km2) is land (73%), and 26 square miles (67 km2) is water (27%); the borough is the second-largest in land area among the boroughs of New York City. However, Kings County, coterminous with Brooklyn, is New York State's fourth-smallest county by land area and third-smallest by total area. Brooklyn lies at the southwestern end of Long Island, and the borough's western border constitutes the island's western tip. Brooklyn's water borders are extensive and varied, including Jamaica Bay; the Atlantic Ocean; The Narrows, separating Brooklyn from the borough of Staten Island in New York City and crossed by the Verrazzano-Narrows Bridge; Upper New York Bay, separating Brooklyn from Jersey City and Bayonne in the U.S. state of New Jersey; and the East River, separating Brooklyn from the borough of Manhattan in New York City and traversed by the Brooklyn-Battery Tunnel, the Brooklyn Bridge, the Manhattan Bridge, the Williamsburg Bridge, and numerous routes of the New York City Subway. To the east of Brooklyn lies the borough of Queens, which contains John F. Kennedy International Airport in that borough's Jamaica neighborhood, approximately two miles from the border of the East New York neighborhood of Brooklyn. The Downtown Brooklyn skyline, the Manhattan Bridge (far left), and the Brooklyn Bridge (near left) are seen across the East River from Lower Manhattan at sunset in 2013. Under the Köppen climate classification, using the 32 °F (0 °C) coldest month (January) isotherm, Brooklyn experiences a humid subtropical climate (Cfa), with partial shielding from the Appalachian Mountains and moderating influences from the Atlantic Ocean. Brooklyn receives plentiful precipitation all year round, with nearly 50 in (1,300 mm) yearly. The area averages 234 days with at least some sunshine annually, and averages 57% of possible sunshine annually, accumulating 2,535 hours of sunshine per annum. Brooklyn lies in the USDA 7b plant hardiness zone. Since 2010, the population of Brooklyn was estimated by the United States Census Bureau to have increased 5.8% to 2,648,771, as of 2017 – Brooklyn's estimated population represented 30.7% of New York City's estimated population of 8,622,698; 33.7% of Long Island's population of 7,869,820; and 13.3% of New York State's population of 19,849,399. Haredim Jewish residents in Brooklyn, home to the largest Jewish community in the United States, with approximately 600,000 individuals. About 23% of the borough's population in 2011 was Jewish. According to the 2010 United States Census, Brooklyn's population was 42.8% White, including 35.7% non-Hispanic White; 34.3% Black, including 31.9% non-Hispanic black; 10.5% Asian; 0.5% Native American; 0.0% (rounded) Pacific Islander; 3.0% Multiracial American; and 8.8% from Other races. Hispanics and Latinos made up 19.8% of Brooklyn's population. Celebrating Chinese New Year in "Little Fuzhou", one of several Chinatowns in Brooklyn, in Sunset Park. Brooklyn's rapidly growing Chinese American population was estimated to have surpassed 200,000 in 2014. In 2010, Brooklyn had some neighborhoods segregated based on race, ethnicity, and religion. Overall, the southwest half of Brooklyn is racially mixed although it contains few black residents; the northeast section is mostly black and Hispanic/Latino. According to the 2012 U.S. Census Bureau estimates, there are 2,565,635 people (up from 2.3 million in 1990), 880,727 households, and 583,922 families living in Brooklyn. The population density was 34,920/square mile (13,480/km²). There were 930,866 housing units at an average density of 13,180/square mile (5,090/km²). Of the 880,727 households in Brooklyn, 38.6% were married couples living together, 22.3% had a female householder with no husband present, and 33.7% were non-families. 33.3% had children under the age of 18 living in them. Of all households 27.8% are made up of individuals and 9.8% had someone living alone who was 65 years of age or older. The average household size was 2.75 and the average family size was 3.41. In Brooklyn the population was spread out with 26.9% under the age of 18, 10.3% from 18 to 24, 30.8% from 25 to 44, 20.6% from 45 to 64, and 11.5% who are 65 years of age or older. The median age was 33 years. Brooklyn has more women and girls, with 88.4 males for every 100 females. Brooklyn's lesbian community is the largest out of all of the New York City boroughs. The median income for households in Brooklyn was $32,135, and the median income for a family was $36,188. Males had a median income of $34,317, which was higher than females, whose median income was $30,516. The per capita income was $16,775. About 22% of families and 25.1% of the population were below the poverty line, including 34% of those under age 18 and 21.5% of those age 65 or over. Brooklyn has a high degree of linguistic diversity. As of 2010, 54.12% (1,240,416) of Brooklyn residents ages 5 and older spoke English at home as a primary language, while 17.16% (393,340) spoke Spanish, 6.46% (148,012) Chinese, 5.31% (121,607) Russian, 3.47% (79,469) Yiddish, 2.75% (63,019) French Creole, 1.35% (31,004) Italian, 1.20% (27,440) Hebrew, 1.01% (23,207) Polish, 0.99% (22,763) French, 0.95% (21,773) Arabic, 0.85% (19,388) various Indic languages, 0.70% (15,936) Urdu, and African languages were spoken as a main language by 0.54% (12,305) of the population over the age of five. In total, 45.88% (1,051,456) of Brooklyn's population ages 5 and older spoke a mother language other than English. Brooklyn's neighborhoods are dynamic in ethnic composition. For example, during the early to mid-20th century, Brownsville had a majority of Jewish residents; since the 1970s it has been majority African American. Midwood during the early 20th century was filled with ethnic Irish, then filled with Jewish residents for nearly 50 years, and is slowly becoming a Pakistani enclave. Brooklyn's most populous racial group, white, declined from 97.2% in 1930 to 46.9% by 1990. The borough attracts people previously living in other cities in the United States. Of these, most come from Chicago, Detroit, San Francisco, Washington, D.C., Baltimore, Philadelphia, Boston, Cincinnati, and Seattle. Over 600,000 Jews, particularly Orthodox Jews and Hasidic Jews, have become concentrated in Borough Park, Williamsburg, and Flatbush, where there are many yeshivas, synagogues, and kosher restaurants, as well as many other Jewish businesses. Other notable religious Orthodox and Hasidic Jewish neighborhoods are Kensington, Midwood, Canarsie, Sea Gate, and Crown Heights (home to the Chabad world headquarters). Many hospitals in Brooklyn were started by Jewish charities, including Maimonides Medical Center in Borough Park and Brookdale Hospital in Brownsville. Many non-Orthodox Jews are concentrated in Ditmas Park and Park Slope, with smaller Jewish populations in Brooklyn Heights, Cobble Hill, Brighton Beach, and Coney Island. Over 200,000 Chinese Americans live throughout the southern parts of Brooklyn, in Sunset Park, Bensonhurst, Gravesend, and Homecrest. The largest concentration is in Sunset Park along 8th Avenue, which is known for Chinese culture. It is called "Brooklyn's Chinatown" and its Chinese population is composed in majority by Fuzhounese Americans, rendering this Chinatown with the nicknames "Fuzhou Town (福州埠), Brooklyn" or the "Little Fuzhou (小福州)" of Brooklyn. Many Chinese restaurants can be found throughout Sunset Park, and the area hosts a popular Chinese New Year celebration. Brooklyn's African American and Caribbean communities are spread throughout much of Brooklyn. Brooklyn's West Indian community is concentrated in the Crown Heights, Flatbush, East Flatbush, Kensington, and Canarsie neighborhoods in central Brooklyn. Brooklyn is home to one of the largest communities of West Indians outside of the Caribbean, being rivaled only by Toronto, Miami, Montreal, and London. Although the largest West Indian groups in Brooklyn are mostly Jamaicans, Guyanese and Haitians, there are West Indian immigrants from nearly every part of the Caribbean. Crown Heights and Flatbush are home to many of Brooklyn's West Indian restaurants and bakeries. Brooklyn has an annual, celebrated Carnival in the tradition of pre-Lenten celebrations in the islands. Started by natives of Trinidad and Tobago, the West Indian Labor Day Parade takes place every Labor Day on Eastern Parkway. Bedford-Stuyvesant is home to one of the most famous African American communities in the city, along with Brownsville, East New York, and Coney Island. Bushwick is the largest hub of Brooklyn's Latino American community. Like other Latino neighborhoods in New York City, Bushwick has an established Puerto Rican presence, along with an influx of many Dominicans, South Americans, Central Americans, Mexicans, as well as a more recent influx of Puerto Ricans. As nearly 80% of Bushwick's population is Latino, its residents having created many businesses to support their various national and distinct traditions in food and other items. Sunset Park's population is 42% Latino, made up of these various ethnic groups. Brooklyn's main Latino groups are Puerto Ricans, Mexicans, Dominicans, and Panamanians; they are spread out throughout the borough. Puerto Ricans and Dominicans are predominant in Bushwick, Williamsburg, and East New York, while Mexicans are predominant in Sunset Park and Panamanians in Crown Heights. Brooklyn is also home to many Russians and Ukrainians, who are mainly concentrated in the areas of Brighton Beach and Sheepshead Bay. Brighton Beach features many Russian and Ukrainian businesses and has been nicknamed Little Russia and Little Odessa, respectively. Originally these communities were mostly Jewish; however, in more recent years, the non-Jewish Russian and Ukrainian communities of Brighton Beach have grown in size and the area now reflects diverse aspects of Russian and Ukrainian culture. Brooklyn's Polish are largely concentrated in Greenpoint, which is home to Little Poland. Another Polish Community is Borough Park. They are also scattered throughout the southern parts of Brooklyn. Italian Americans are mainly concentrated in the neighborhoods of Bensonhurst, Dyker Heights, Bay Ridge, Bath Beach, Gravesend, Cobble Hill, and Carroll Gardens, where there are many Italian restaurants, bakeries, delicatessens, pizzerias, cafes, and social clubs. Today, Arab Americans and Pakistani Americans along with other Muslim communities have moved into the southwest portion of Brooklyn, particularly to Bay Ridge, where there are many Middle Eastern restaurants, hookah lounges, halal shops, Islamic shops and mosques. Coney Island Avenue is home to Little Pakistan as Church Avenue is to Bangladeshis. Jay Street Borough Hall (Downtown Brooklyn) is little Arabia. Pakistani Independence Day is celebrated every year with parades and parties on Coney Island Avenue. Earlier, the area was known predominantly for its Irish, Norwegian, and Scottish populations. There are also many Middle Eastern, particularly Yemeni, businesses, mosques, and restaurants on Atlantic Avenue west of Flatbush Avenue, in Boerum Hill. Brooklyn's Greek Americans live throughout the borough, especially in Bay Ridge and adjacent areas where there is a noticeable cluster of Hellenic-focused schools and cultural institutions, with many businesses concentrated there and in Downtown Brooklyn near Atlantic Avenue. Greek-owned diners are also found throughout the borough. Brooklyn became a preferred site for artists and hipsters to set up live/work spaces after being priced out of the same types of living arrangements in Manhattan. Various neighborhoods in Brooklyn, including Williamsburg, DUMBO, Red Hook, and Park Slope evolved as popular neighborhoods for artists-in-residence. However, rents and costs of living have since increased dramatically in these same neighborhoods, forcing artists to move to somewhat less expensive neighborhoods in Brooklyn or across Upper New York Bay to locales in New Jersey, such as Jersey City or Hoboken. Since consolidation with New York City in 1898, Brooklyn has been governed by the New York City Charter that provides for a "strong" mayor-council system. The centralized government of New York City is responsible for public education, correctional institutions, public safety, recreational facilities, sanitation, water supply, and welfare services. On the other hand, the Brooklyn Public Library is an independent nonprofit organization partially funded by the government of New York City, but also by the government of New York State, the U.S. federal government, and private donors. The office of Borough President was created in the consolidation of 1898 to balance centralization with local authority. Each borough president had a powerful administrative role derived from having a vote on the New York City Board of Estimate, which was responsible for creating and approving the city's budget and proposals for land use. In 1989, the Supreme Court of the United States declared the Board of Estimate unconstitutional because Brooklyn, the most populous borough, had no greater effective representation on the Board than Staten Island, the least populous borough; it was a violation of the high court's 1964 "one man, one vote" reading of the Fourteenth Amendment. Since 1990, the Borough President has acted as an advocate for the borough at the mayoral agencies, the City Council, the New York state government, and corporations. Brooklyn's current Borough President is Eric Adams, elected as a Democrat in November 2013 with 90.8% of the vote. Adams replaced popular Borough President Marty Markowitz, also a Democrat, who partially used his office to promote tourism and new development for Brooklyn. The Democratic Party holds the majority of public offices, and the borough is very liberal. As of November 2017, 89.1% of registered voters in Brooklyn were Democrats. Party platforms center on affordable housing, education and economic development. Pockets of majority Republican influence exist in Gravesend, Bensonhurst, Bay Ridge, Dyker Heights and Midwood by U.S. Representative Dan Donovan and New York State Senator Marty Golden. Each of the city's five counties (coterminous with each borough) has its own criminal court system and District Attorney, the chief public prosecutor who is directly elected by popular vote. The District Attorney of Kings County is Eric Gonzalez, who replaced Democrat Kenneth P. Thompson following his death in October 2016. Brooklyn has 16 City Council members, the largest number of any of the five boroughs. Brooklyn has 18 of the city's 59 community districts, each served by an unpaid Community Board with advisory powers under the city's Uniform Land Use Review Procedure. Each board has a paid district manager who acts as an interlocutor with city agencies. As is the case with sister boroughs Manhattan and the Bronx, Brooklyn has not voted for a Republican in a national presidential election since Calvin Coolidge in 1924. In the 2008 presidential election, Democrat Barack Obama received 79.4% of the vote in Brooklyn while Republican John McCain received 20.0%. In 2012, Barack Obama increased his Democratic margin of victory in the borough, dominating Brooklyn with 82.0% of the vote to Republican Mitt Romney's 16.9%. In 2019, five Democrats represented Brooklyn in the United States House of Representatives. One congressional district lies entirely within the borough. Nydia Velázquez (first elected in 1992) represents New York's 7th congressional district, which includes the central-west Brooklyn neighborhoods of Brooklyn Heights, Boerum Hill, Bushwick, Carroll Gardens, Cobble Hill, Dumbo, East New York, East Williamsburg, Greenpoint, Gowanus, Red Hook, Sunset Park, and Williamsburg. The district also covers a small portion of Queens. Hakeem Jeffries (first elected in 2012) represents New York's 8th congressional district, which includes the southern Brooklyn neighborhoods of Bedford-Stuyvesant, Bergen Beach, Brighton Beach, Brownsville, Brighton Beach, Canarsie, Clinton Hill, Coney Island, East Flatbush, East New York, Fort Greene, Gerritsen Beach, Marine Park, Mill Basin, Ocean Hill, Sheepshead Bay, and Spring Creek. The district also covers a small portion of Queens. Yvette Clarke (first elected in 2006) represents New York's 9th congressional district, which includes the central and southern Brooklyn neighborhoods of Crown Heights, East Flatbush, Flatbush, Midwood, Park Slope, Prospect Heights, Prospect Lefferts Gardens, and Windsor Terrace. Jerrold Nadler (first elected in 1992) represents New York's 10th congressional district, which includes the southwestern Brooklyn neighborhoods of Midwood, Red Hook, Sunset Park, Bensonhurst, Borough Park, Gravesend, Kensington, and Mapleton. The district also covers the West Side of Manhattan. Max Rose (first elected in 2018) represents New York's 11th congressional district, which includes the southwestern Brooklyn neighborhoods of Bensonhurst, Gravesend, Bath Beach, Bay Ridge, and Dyker Heights. The district also covers all of Staten Island. Brooklyn's job market is driven by three main factors: the performance of the national and city economy, population flows and the borough's position as a convenient back office for New York's businesses. Forty-four percent of Brooklyn's employed population, or 410,000 people, work in the borough; more than half of the borough's residents work outside its boundaries. As a result, economic conditions in Manhattan are important to the borough's jobseekers. Strong international immigration to Brooklyn generates jobs in services, retailing and construction. Since the late 20th century, Brooklyn has benefited from a steady influx of financial back office operations from Manhattan, the rapid growth of a high-tech and entertainment economy in DUMBO, and strong growth in support services such as accounting, personal supply agencies, and computer services firms. Jobs in the borough have traditionally been concentrated in manufacturing, but since 1975, Brooklyn has shifted from a manufacturing-based to a service-based economy. In 2004, 215,000 Brooklyn residents worked in the services sector, while 27,500 worked in manufacturing. Although manufacturing has declined, a substantial base has remained in apparel and niche manufacturing concerns such as furniture, fabricated metals, and food products. The pharmaceutical company Pfizer was founded in Brooklyn in 1869 and had a manufacturing plant in the borough for many years that once employed thousands of workers, but the plant shut down in 2008. However, new light-manufacturing concerns packaging organic and high-end food have sprung up in the old plant. First established as a shipbuilding facility in 1801, the Brooklyn Navy Yard employed 70,000 people at its peak during World War II and was then the largest employer in the borough. The Missouri, the ship on which the Japanese formally surrendered, was built there, as was the Maine, whose sinking off Havana led to the start of the Spanish–American War. The iron-sided Civil War vessel the Monitor was built in Greenpoint. From 1968–1979 Seatrain Shipbuilding was the major employer. Later tenants include industrial design firms, food processing businesses, artisans, and the film and television production industry. About 230 private-sector firms providing 4,000 jobs are at the Yard. Construction and services are the fastest growing sectors. Most employers in Brooklyn are small businesses. In 2000, 91% of the approximately 38,704 business establishments in Brooklyn had fewer than 20 employees. As of August 2008[update], the borough's unemployment rate was 5.9%. Brooklyn is also home to many banks and credit unions. According to the Federal Deposit Insurance Corporation, there were 37 banks and 26 credit unions operating in the borough in 2010. The rezoning of Downtown Brooklyn has generated over US$10 billion of private investment and $300 million in public improvements since 2004. Brooklyn is also attracting numerous high technology start-up companies, as Silicon Alley, the metonym for New York City's entrepreneurship ecosystem, has expanded from Lower Manhattan into Brooklyn. Brooklyn has played a major role in various aspects of American culture including literature, cinema, and theater. The Brooklyn accent has often been portrayed as the "typical New York accent" in American media, although this accent and stereotype are supposedly fading out. Brooklyn's official colors are blue and gold. Brooklyn hosts the world-renowned Brooklyn Academy of Music, the Brooklyn Philharmonic, and the second largest public art collection in the United States, housed in the Brooklyn Museum. The Brooklyn Museum, opened in 1897, is New York City's second-largest public art museum. It has in its permanent collection more than 1.5 million objects, from ancient Egyptian masterpieces to contemporary art. The Brooklyn Children's Museum, the world's first museum dedicated to children, opened in December 1899. The only such New York State institution accredited by the American Alliance of Museums, it is one of the few globally to have a permanent collection – over 30,000 cultural objects and natural history specimens. The Brooklyn Academy of Music (BAM) includes a 2,109-seat opera house, an 874-seat theater, and the art house BAM Rose Cinemas. Bargemusic and St. Ann's Warehouse are located on the other side of Downtown Brooklyn in the DUMBO arts district. Brooklyn Technical High School has the second-largest auditorium in New York City (after Radio City Music Hall), with a seating capacity of over 3,000. Brooklyn has several local newspapers: The Brooklyn Daily Eagle, Bay Currents (Oceanfront Brooklyn), Brooklyn View, The Brooklyn Paper, and Courier-Life Publications. Courier-Life Publications, owned by Rupert Murdoch's News Corporation, is Brooklyn's largest chain of newspapers. Brooklyn is also served by the major New York dailies, including The New York Times, the New York Daily News, and the New York Post. The borough is home to the bi-weekly cultural guide The L Magazine and the arts and politics monthly Brooklyn Rail, as well as the arts and cultural quarterly Cabinet. Hello Mr. is also published in Brooklyn. Brooklyn Magazine is one of the few glossy magazines about Brooklyn. Several others, that are now defunct, include: BKLYN Magazine (a bimonthly lifestyle book owned by Joseph McCarthy, that saw itself as a vehicle for high-end advertisers in Manhattan and was mailed to 80,000 high-income households), Brooklyn Bridge Magazine, The Brooklynite (a free, glossy quarterly edited by Daniel Treiman), and NRG (edited by Gail Johnson and originally marketed as a local periodical for Clinton Hill and Fort Greene, but expanded in scope to become the self-proclaimed "Pulse of Brooklyn" and then the "Pulse of New York"). Brooklyn has a thriving ethnic press. El Diario La Prensa, the largest and oldest Spanish-language daily newspaper in the United States, maintains its corporate headquarters at 1 MetroTech Center in downtown Brooklyn. Major ethnic publications include the Brooklyn-Queens Catholic paper The Tablet, Hamodia, an Orthodox Jewish daily and The Jewish Press, an Orthodox Jewish weekly. Many nationally distributed ethnic newspapers are based in Brooklyn. Over 60 ethnic groups, writing in 42 languages, publish some 300 non-English language magazines and newspapers in New York City. Among them the quarterly "L'Idea", a bilingual magazine printed in Italian and English since 1974. In addition, many newspapers published abroad, such as The Daily Gleaner and The Star of Jamaica, are available in Brooklyn. [citation needed] Our Time Press published weekly by DBG Media covers the Village of Brooklyn with a motto of "The Local paper with the Global View". The annual Coney Island Mermaid Parade (mid-to-late June) is a costume-and-float parade. Coney Island also hosts the annual Nathan's Hot Dog Eating Contest (July 4). The annual Labor Day Carnival (also known as the Labor Day Parade or West Indian Day Parade) takes place along Eastern Parkway in Crown Heights. The Art of Brooklyn Film Festival runs annually around the second week of June. Kwanzan Cherries in bloom at Brooklyn Botanic Garden. Brooklyn Botanic Garden: located adjacent to Prospect Park is the 52-acre (21 ha) botanical garden, which includes a cherry tree esplanade, a one-acre (0.4 ha) rose garden, a Japanese hill and pond garden, a fragrance garden, a water lily pond esplanade, several conservatories, a rock garden, a native flora garden, a bonsai tree collection, and children's gardens and discovery exhibits. Coney Island developed as a playground for the rich in the early 1900s, but it grew as one of America's first amusement grounds and attracted crowds from all over New York. The Cyclone rollercoaster, built in 1927, is on the National Register of Historic Places. The 1920 Wonder Wheel and other rides are still operational. Coney Island went into decline in the 1970s, but has undergone a renaissance. Floyd Bennett Field: the first municipal airport in New York City and long closed for operations, is now part of the National Park System. Many of the historic hangars and runways are still extant. Nature trails and diverse habitats are found within the park, including salt marsh and a restored area of shortgrass prairie that was once widespread on the Hempstead Plains. Green-Wood Cemetery, founded by the social reformer Henry Evelyn Pierrepont in 1838, is an early Rural cemetery. It is the burial ground of many notable New Yorkers. New York Transit Museum displays historical artifacts of Greater New York's subway, commuter rail, and bus systems; it is located at Court Street, a former Independent Subway System station in Brooklyn Heights on the Fulton Street Line. Prospect Park is a public park in central Brooklyn encompassing 585 acres (2.37 km2). The park was designed by Frederick Law Olmsted and Calvert Vaux, who created Manhattan's Central Park. Attractions include the Long Meadow, a 90-acre (36 ha) meadow, the Picnic House, which houses offices and a hall that can accommodate parties with up to 175 guests; Litchfield Villa, Prospect Park Zoo, the Boathouse, housing a visitors center and the first urban Audubon Center; Brooklyn's only lake, covering 60 acres (24 ha); the Prospect Park Bandshell that hosts free outdoor concerts in the summertime; and various sports and fitness activities including seven baseball fields. Prospect Park hosts a popular annual Halloween Parade. Fort Greene Park is a public park in the Fort Greene Neighborhood. The park contains the Prison Ship Martyrs' Monument, a monument to American prisoners during the revolutionary war. Barclays Center, located in Pacific Park within Prospect Heights, home of the Nets, as well as part-time home of the Islanders. Brooklyn's major professional sports team is the NBA's Brooklyn Nets. The Nets moved into the borough in 2012, and play their home games at Barclays Center in Prospect Heights. Previously, the Nets had played in Uniondale, New York and in New Jersey. Barclays Center is also one of the home arenas for the NHL's New York Islanders (the other is Nassau Coliseum in Uniondale). The Islanders had originally played at Nassau Coliseum full-time since their inception until 2015, when the team moved to Barclays Center full-time for three seasons. Brooklyn also has a storied sports history. It has been home to many famous sports figures such as Joe Paterno, Vince Lombardi, Mike Tyson, Joe Torre, Sandy Koufax, Billy Cunningham and Vitas Gerulaitis. Basketball legend Michael Jordan was born in Brooklyn though he grew up in Wilmington, North Carolina. In the earliest days of organized baseball, Brooklyn teams dominated the new game. The second recorded game of baseball was played near what is today Fort Greene Park on October 24, 1845. Brooklyn's Excelsiors, Atlantics and Eckfords were the leading teams from the mid-1850s through the Civil War, and there were dozens of local teams with neighborhood league play, such as at Mapleton Oval. During this "Brooklyn era", baseball evolved into the modern game: the first fastball, first changeup, first batting average, first triple play, first pro baseball player, first enclosed ballpark, first scorecard, first known African-American team, first black championship game, first road trip, first gambling scandal, and first eight pennant winners were all in or from Brooklyn. Brooklyn's most famous historical team, the Brooklyn Dodgers, named for "trolley dodgers" played at Ebbets Field. In 1947 Jackie Robinson was hired by the Dodgers as the first African-American player in Major League Baseball in the modern era. In 1955, the Dodgers, perennial National League pennant winners, won the only World Series for Brooklyn against their rival New York Yankees. The event was marked by mass euphoria and celebrations. Just two years later, the Dodgers moved to Los Angeles. Walter O'Malley, the team's owner at the time, is still vilified, even by Brooklynites too young to remember the Dodgers as Brooklyn's ball club. After a 43-year hiatus, professional baseball returned to the borough in 2001 with the Brooklyn Cyclones, a minor league team that plays in MCU Park in Coney Island. They are an affiliate of the New York Mets. The New York Cosmos of the NASL began playing at MCU Park in 2017. Brooklyn once had a National Football League team named the Brooklyn Lions in 1926, who played at Ebbets Field. Brooklyn has one of the most active recreational fishing fleets in the United States. In addition to a large private fleet along Jamaica Bay, there is also a substantial public fleet within Sheepshead Bay that includes the Marily Jean, Ocean Eagle, Brooklyn, Captain Dave, Midnight Star, Sea Queen and Flamingo. Species that are caught include Black Fish, Porgy, Striped Bass, Black Sea Bass, Fluke, and Flounder. About 57 percent of all households in Brooklyn were households without automobiles. The citywide rate is 55 percent in New York City. Proposed New York City Subway lines never built include a line along Nostrand or Utica Avenues to Marine Park, as well as a subway line to Spring Creek. Brooklyn was once served by an extensive network of streetcars, many of which were replaced by the public bus network that covers the entire borough. There is also daily express bus service into Manhattan. New York's famous yellow cabs also provide transportation in Brooklyn, although they are less numerous in the borough. There are three commuter rail stations in Brooklyn: East New York, Nostrand Avenue, and Atlantic Terminal, the terminus of the Atlantic Branch of the Long Island Rail Road. The terminal is located near the Atlantic Avenue – Barclays Center subway station, with ten connecting subway services. In February 2015, Mayor Bill de Blasio announced that the city government would begin a citywide ferry service called NYC Ferry to extend ferry transportation to communities in the city that have been traditionally underserved by public transit. The ferry opened in May 2017, with the Bay Ridge ferry serving southwestern Brooklyn and the East River Ferry serving northwestern Brooklyn. A third route, the Rockaway ferry, makes one stop in the borough at Brooklyn Army Terminal. A streetcar line, the Brooklyn–Queens Connector, was proposed by the city in February 2016, with the planned timeline calling for service to begin around 2024. The great majority of limited-access expressways and parkways are located in the western and southern sections of Brooklyn. These include the Brooklyn-Queens Expressway, the Gowanus Expressway (which is part of the Brooklyn-Queens Expressway), the Prospect Expressway (New York State Route 27), the Belt Parkway, and the Jackie Robinson Parkway (formerly the Interborough Parkway). Planned expressways that were never built include the Bushwick Expressway, an extension of I-78 and the Cross-Brooklyn Expressway, I-878. Major thoroughfares include Atlantic Avenue, Fourth Avenue, 86th Street, Kings Highway, Bay Parkway, Ocean Parkway, Eastern Parkway, Linden Boulevard, McGuinness Boulevard, Flatbush Avenue, Pennsylvania Avenue, and Nostrand Avenue. Much of Brooklyn has only named streets, but Park Slope, Bay Ridge, Sunset Park, Bensonhurst, and Borough Park and the other western sections have numbered streets running approximately northwest to southeast, and numbered avenues going approximately northeast to southwest. East of Dahill Road, lettered avenues (like Avenue M) run east and west, and numbered streets have the prefix "East". South of Avenue O, related numbered streets west of Dahill Road use the "West" designation. This set of numbered streets ranges from West 37th Street to East 108 Street, and the avenues range from A-Z with names substituted for some of them in some neighborhoods (notably Albemarle, Beverley, Cortelyou, Dorchester, Ditmas, Foster, Farragut, Glenwood, Quentin). Numbered streets prefixed by "North" and "South" in Williamsburg, and "Bay", "Beach", "Brighton", "Plumb", "Paerdegat" or "Flatlands" along the southern and southwestern waterfront are loosely based on the old grids of the original towns of Kings County that eventually consolidated to form Brooklyn. These names often reflect the bodies of water or beaches around them, such as Plumb Beach or Paerdegat Basin. Brooklyn is connected to Manhattan by three bridges, the Brooklyn, Manhattan, and Williamsburg Bridges; a vehicular tunnel, the Brooklyn–Battery Tunnel (also known as the Hugh L. Carey Tunnel); and several subway tunnels. The Verrazzano-Narrows Bridge links Brooklyn with the more suburban borough of Staten Island. Though much of its border is on land, Brooklyn shares several water crossings with Queens, including the Pulaski Bridge, the Greenpoint Avenue Bridge, the Kosciuszko Bridge (part of the Brooklyn-Queens Expressway), and the Grand Street Bridge, all of which carry traffic over Newtown Creek, and the Marine Parkway Bridge connecting Brooklyn to the Rockaway Peninsula. Brooklyn was long a major shipping port, especially at the Brooklyn Army Terminal and Bush Terminal in Sunset Park. Most container ship cargo operations have shifted to the New Jersey side of New York Harbor, while the Brooklyn Cruise Terminal in Red Hook is a focal point for New York's growing cruise industry. The Queen Mary 2, one of the world's largest ocean liners, was designed specifically to fit under the Verrazzano-Narrows Bridge, the longest suspension bridge in the United States. She makes regular ports of call at the Red Hook terminal on her transatlantic crossings from Southampton, England. In February 2015, Mayor Bill de Blasio announced that the city government would begin NYC Ferry to extend ferry transportation to traditionally underserved communities in the city. The ferry opened in May 2017, offering commuter services from the western shore of Brooklyn to Manhattan via three routes. The East River Ferry serves points in Lower Manhattan, Midtown, Long Island City, and northwestern Brooklyn via its East River route. The South Brooklyn and Rockaway routes serve southwestern Brooklyn before terminating in lower Manhattan. NY Waterway offers tours and charters. SeaStreak also offers weekday ferry service between the Brooklyn Army Terminal and the Manhattan ferry slips at Pier 11 downtown and East 34th Street in midtown. A Cross-Harbor Rail Tunnel, originally proposed in the 1920s as a core project for the then new Port Authority of New York is again being studied and discussed as a way to ease freight movements across a large swath of the metropolitan area. Manhattan Bridge seen from Brooklyn Bridge Park. Education in Brooklyn is provided by a vast number of public and private institutions. Public schools in the borough are managed by the New York City Department of Education, the largest public school system. Brooklyn Technical High School (commonly called Brooklyn Tech), a New York City public high school, is the largest specialized high school for science, mathematics, and technology in the United States. Brooklyn Tech opened in 1922. Brooklyn Tech is located across the street from Fort Greene Park. This high school was built from 1930 to 1933 at a cost of about $6 million and is 12 stories high. It covers about half of a city block. Brooklyn Tech is noted for its famous alumni (including two Nobel Laureates), its academics, and the large number of graduates attending prestigious universities. Brooklyn College is a senior college of the City University of New York, and was the first public coeducational liberal arts college in New York City. The College ranked in the top 10 nationally for the second consecutive year in Princeton Review’s 2006 guidebook, America’s Best Value Colleges. Many of its students are first and second generation Americans. Founded in 1970, Medgar Evers College is a senior college of the City University of New York, with a mission to develop and maintain high quality, professional, career-oriented undergraduate degree programs in the context of a liberal arts education. The College offers programs both at the baccalaureate and associate degree levels, as well as Adult and Continuing Education classes for Central Brooklyn residents, corporations, government agencies, and community organizations. Medgar Evers College is a few blocks east of Prospect Park in Crown Heights. CUNY's New York City College of Technology (City Tech) of The City University of New York (CUNY) (Downtown Brooklyn/Brooklyn Heights) is the largest public college of technology in New York State and a national model for technological education. Established in 1946, City Tech can trace its roots to 1881 when the Technical Schools of the Metropolitan Museum of Art were renamed the New York Trade School. That institution—which became the Voorhees Technical Institute many decades later—was soon a model for the development of technical and vocational schools worldwide. In 1971, Voorhees was incorporated into City Tech. SUNY Downstate College of Medicine, founded as the Long Island College Hospital in 1860, is the oldest hospital-based medical school in the United States. The Medical Center comprises the College of Medicine, College of Health Related Professions, College of Nursing, School of Public Health, School of Graduate Studies, and University Hospital of Brooklyn. The Nobel Prize winner Robert F. Furchgott was a member of its faculty. Half of the Medical Center's students are minorities or immigrants. The College of Medicine has the highest percentage of minority students of any medical school in New York State. Brooklyn Law School was founded in 1901 and is notable for its diverse student body. Women and African Americans were enrolled in 1909. According to the Leiter Report, a compendium of law school rankings published by Brian Leiter, Brooklyn Law School places 31st nationally for quality of students. Long Island University is a private university headquartered in Brookville on Long Island, with a campus in Downtown Brooklyn with 6,417 undergraduate students. The Brooklyn campus has strong science and medical technology programs, at the graduate and undergraduate levels. Pratt Institute, in Clinton Hill, is a private college founded in 1887 with programs in engineering, architecture, and the arts. Some buildings in the school's Brooklyn campus are official landmarks. Pratt has over 4700 students, with most at its Brooklyn campus. Graduate programs include library and information science, architecture, and urban planning. Undergraduate programs include architecture, construction management, writing, critical and visual studies, industrial design and fine arts, totaling over 25 programs in all. The New York University Tandon School of Engineering, the United States' second oldest private institute of technology, founded in 1854, has its main campus in Downtown's MetroTech Center, a commercial, civic and educational redevelopment project of which it was a key sponsor. NYU-Tandon is one of the 18 schools and colleges that comprise New York University (NYU). St. Francis College is a Catholic college located in Brooklyn Heights and was founded in 1859 by Franciscan friars. Today, there are over 2,400 students attending the small liberal arts college. St. Francis is considered by The New York Times as one of the more diverse colleges, and was ranked one of the best baccalaureate colleges by both Forbes magazine and U.S. News & World Report. Brooklyn also has smaller liberal arts institutions, such as Saint Joseph's College in Clinton Hill and Boricua College in Williamsburg. Kingsborough Community College is a junior college in the City University of New York system, located in Manhattan Beach. The Central Library at Grand Army Plaza. As an independent system, separate from the New York and Queens public library systems, the Brooklyn Public Library offers thousands of public programs, millions of books, and use of more than 850 free Internet-accessible computers. It also has books and periodicals in all the major languages spoken in Brooklyn, including English, Russian, Chinese, Spanish, Hebrew, and Haitian Creole, as well as French, Yiddish, Hindi, Bengali, Polish, Italian, and Arabic. The Central Library is a landmarked building facing Grand Army Plaza. There are 58 library branches, placing one within a half mile of each Brooklyn resident. In addition to its specialized Business Library in Brooklyn Heights, the Library is preparing to construct its new Visual & Performing Arts Library (VPA) in the BAM Cultural District, which will focus on the link between new and emerging arts and technology and house traditional and digital collections. It will provide access and training to arts applications and technologies not widely available to the public. The collections will include the subjects of art, theater, dance, music, film, photography and architecture. A special archive will house the records and history of Brooklyn's arts communities. ^ a b c QuickFacts for Kings County (Brooklyn Borough), New York, United States Census Bureau. Retrieved March 28, 2018. ^ GCT-PH1; Population, Housing Units, Area, and Density: 2000 - United States -- County by State; and for Puerto Rico from the Census 2000 Summary File 1 (SF 1) 100-Percent Data, United States Census Bureau. Retrieved September 18, 2016. ^ a b 2010 Gazetteer for New York State, United States Census Bureau. Retrieved September 18, 2016. ^ Henry Alford (May 1, 2013). "How I Became a Hipster". The New York Times. Retrieved March 30, 2016. ^ "19 Reasons Why Brooklyn Is New York's New Startup Hotspot". CB Insights. October 19, 2015. Retrieved March 30, 2016. ^ a b Vanessa Friedman (April 30, 2016). "Brooklyn's Wearable Revolution". The New York Times. Retrieved April 30, 2016. ^ Alexandria Symonds (April 29, 2016). "One Celebrated Brooklyn Artist's Futuristic New Practice". The New York Times. Retrieved April 29, 2016. ^ "Current Population Estimates: NYC". NYC.gov. Retrieved June 10, 2017. ^ QuickFacts New York city, New York; Bronx County (Bronx Borough), New York; Kings County (Brooklyn Borough), New York; New York County (Manhattan Borough), New York; Queens County (Queens Borough), New York; Richmond County (Staten Island Borough), New York, United States Census Bureau. Accessed June 11, 2018. ^ Carroll, Maurice (September 16, 1971). "Historical District Named in Brooklyn". The New York Times. Retrieved July 16, 2017. ^ Dexter, Franklin B. (April 1885). "The History of Connecticut, as Illustrated by the Names of Her Towns". Proceedings of the American Antiquarian Society. American Antiquarian Society: 438. ^ Powell, Lyman Pierson (1899). Historic Towns of the Middle States. G. P. Putnam's sons. p. 216. Retrieved July 16, 2017. ^ Winter, J. M. Van (1998). Sources concerning the hospitallers of St John in the Netherlands: 14th-18th centuries. BRILL. p. 765. ISBN 9004108033. Retrieved July 16, 2017. ^ Ellis, Edward Robb (2011). The Epic of New York City: A Narrative History. Basic Books. p. 42. ISBN 9780465030538. Retrieved July 16, 2017. ^ Rensselaer, Schuyler Van (1909). History of the City of New York in the Seventeenth Century: New York under the Stuarts. Macmillan. p. 149. Retrieved July 16, 2017. ^ Chisholm, Hugh (1910). The Encyclopaedia Britannica: A Dictionary of Arts, Sciences, Literature and General Information. Encyclopaedia Britannica. p. 648. Retrieved July 16, 2017. ^ Brooklyn Daily Eagle, "Map of six townships"
^ Notes Geographical and Historical, relating to the Town of Brooklyn, in Kings County on Long-Island. ^ "Slavery Here. Right in Brooklyn and Out on Long Island". Brooklyn Daily Eagle. December 29, 1891. p. 2. Retrieved October 18, 2017. ^ "The Brooklyn Eagle and Kings County Democrat". October 26, 1841. Retrieved July 29, 2014 – via Newspapers.com. ^ "The Brooklyn Eagle and Kings County Democrat". bklyn.newspapers.com. Newspapers.com. October 26, 1841. Retrieved July 29, 2014. ^ "Abolitionist Brooklyn (1828 – 1849) | In Pursuit of Freedom". Retrieved February 1, 2019. ^ Jacob Judd, "Policing the City of Brooklyn in the 1840's and 1850's", Journal of Long Island History (1966) (6)2 pp. 13–22. ^ McCullough, David W; Kalett, Jim (1983). Brooklyn-- and how it got that way. New York, NY: Dial Press. p. 58. ISBN 0385274270. ^ Peel, M. C.; Finlayson, B. L.; McMahon, T. A. "World Map of Köppen-Geiger climate classification". The University of Melbourne. Archived from the original on January 13, 2015. Retrieved March 29, 2016. ^ . Retrieved March 29, 2016. ^ "USDA Plant Hardiness Zone Map". Agricultural Research Center, PRISM Climate Group Oregon State University. Archived from the original on February 27, 2014. Retrieved March 29, 2016. ^ "NowData - NOAA Online Weather Data". National Oceanic and Atmospheric Administration. Retrieved April 18, 2016. ^ "Station Name: NY NEW YORK JFK INTL AP". National Oceanic and Atmospheric Administration. Retrieved March 28, 2014. ^ "NEW YORK/JFK, NY Climate Normals 1961−1990". NOAA. Retrieved March 23, 2014. ^ ""Notes Geographical and Historical, relating to the Town of Brooklyn, i" by Gabriel Furman and Paul Royster (transcriber & depositor)". Digitalcommons.unl.edu. March 21, 2006. Retrieved December 22, 2010. ^ "U.S. Decennial Census". United States Census Bureau. Archived from the original on May 12, 2015. Retrieved January 5, 2015. ^ "Census of Population and Housing". Census.gov. Archived from the original on May 12, 2015. Retrieved June 4, 2016. ^ . Retrieved March 30, 2018. ^ "Kings County, New York QuickFacts". U.S. Census Bureau. Archived from the original on February 17, 2016. Retrieved March 24, 2016. ^ "State & County QuickFacts - Queens County (Queens Borough), New York". United States Census Bureau. Archived from the original on August 8, 2014. Retrieved March 24, 2016. ^ "Nassau County, New York QuickFacts". U.S. Census Bureau. Archived from the original on July 15, 2011. Retrieved March 24, 2016. ^ "Suffolk County, New York QuickFacts". U.S. Census Bureau. Retrieved March 24, 2016. ^ Weichselbaum, Simone (June 26, 2012). "Nearly one in four Brooklyn residents are Jews, new study finds". Daily News. New York. Retrieved March 31, 2016. ^ "Profile of General Population and Housing Characteristics: 2010 - 2010 Demographic Profile Data". United States Census Bureau. Retrieved April 1, 2016. ^ "Selected Population Profile in the United States - 2014 American Community Survey 1-Year Estimates - Kings County, New York Chinese alone". United States Census Bureau. Retrieved March 31, 2016. ^ "The Racial Dot Map: One Dot Per Person for the Entire U.S." Archived from the original on September 21, 2013. ^ "U.S. Census Bureau, "Residential Population and Components of Change New York State and Counties, April 1, 2000 to July 1, 2005"" (PDF). Archived from the original (PDF) on July 23, 2006. Retrieved August 4, 2006. ^ Tracy, Thomas (October 7, 2009). "Brooklyn's LGBT community to join Washington march". New York Post. Retrieved October 24, 2010. ^ "Kings County (Brooklyn Borough), New York". State & County QuickFacts. U.S. Census Bureau. Archived from the original on February 17, 2016. ^ a b c d Gibson, Campbell; and Jung, Kay. "Historical Census Statistics on Population Totals by Race, 1790 to 1990, and by Hispanic Origin, 1970 to 1990, for Large Cities and Other Urban Places in the United States" Archived August 6, 2012, at WebCite, United States Census Bureau, February 2005. Retrieved November 19, 2016. ^ "Kings County, New York". Modern Language Association. Archived from the original on August 15, 2013. Retrieved August 10, 2013. ^ "African Americans", Encyclopedia of Chicago. Retrieved March 1, 2008. ^ Gibson, Campbell (June 1998). Population of the 100 Largest Cities and Other Urban Places in the United States: 1790 to 1990, United States Census Bureau. Retrieved November 19, 2016. ^ Ritter, John (August 28, 2007). "San Francisco Hopes to Reverse Black Flight". USA Today. Retrieved October 24, 2010. ^ "Census Shows More Black Residents Are Leaving New York and Other Cities". The New York Times. September 12, 2007. ^ "State & County QuickFacts: California". U.S. Census Bureau. Archived from the original on December 28, 2009. Retrieved February 11, 2007. ^ Muhammad, Nisa Islam. "D.C. 'exodus' sparks district renewal efforts for Whites", The Final Call, June 21, 2007. Retrieved June 25, 2007. ^ "We Speak Your Language". maimonidesmed.org. Archived from the original on May 18, 2015. Retrieved May 16, 2015. ^ "'Scrubs' Near the D Train". The New York Times. May 11, 2008. ^ Michelle Higgins (August 22, 2014). "Life After Brooklyn - Moving Out of Brooklyn Because of High Prices". The New York Times. Retrieved August 24, 2016. ^ Cornell Law School Supreme Court Collection: Board of Estimate of City of New York v. Morris. Retrieved June 12, 2006. ^ "Enrollment info" (PDF). elections.ny.gov. ^ "Acting DA Gonzalez to finish term despite push for Letitia James". ^ a b c d e f "New York Senators, Representatives, and Congressional District Maps". GovTrack.us. May 21, 2018. Retrieved December 29, 2018. ^ "Food Start-Ups Find a Home in Brooklyn". The New York Times. March 28, 2012. ^ A Case Study of Seatrain Shipbuilding & the Brooklyn Navy Yard. ^ "New York State Dept of Labor". Labor.state.ny.us. Archived from the original on October 5, 2008. Retrieved October 24, 2010. ^ "FDIC Office Directory". FDIC.gov. Archived from the original on May 10, 2000. Retrieved October 24, 2010. ^ "Credit Unions in Brooklyn, NY". Branchspot.com. November 9, 2015. Retrieved November 9, 2015. ^ Maya Kosoff (February 5, 2015). "These are the 11 hottest tech startups in Brooklyn". Business Insider. Retrieved March 29, 2016. ^ Sheila McClear (February 6, 2010). "Why the classic Noo Yawk accent is fading away". New York Post. Retrieved March 29, 2016. ^ "Brooklyn Technical High School, K430, Borough of Brooklyn, Zip Code 11217". Schools.nyc.gov. October 31, 2008. Retrieved October 24, 2010. ^ LEON NEYFAKH, Special to the Sun (July 5, 2006). "Latest Boom in Brooklyn is in Failures of Glossy Magazines". New York Sun. ^ "Contact Archived June 12, 2010, at the Wayback Machine." ImpreMedia. Retrieved June 1, 2010. ^ a b Ward, Nathan (August – September 2005). "Brooklyn Rising". American Heritage. Archived from the original on May 27, 2007. ^ "The Art of Brooklyn Film Festival". The Art of Bklyn. Retrieved June 30, 2017. ^ "New park adds rides at Coney Island". Reading Eagle. Retrieved June 29, 2010. ^ "About Prospect Park". Prospect Park Alliance: Official Web Site of Prospect Park. Prospect Park Alliance. 2008. Retrieved November 29, 2008. ^ "Audubon New York". National Audubon Society. 2008. Archived from the original on January 16, 2009. Retrieved November 29, 2008. ^ "Rare Sport for Connoisseurs: How Baseball Was Born in Brooklyn". Oldbrooklynbaseball.com. Retrieved October 24, 2010. ^ Ebbets Field Archived October 9, 2007, at the Wayback Machine. Retrieved October 10, 2007. ^ Elstein, Aaron. "Renowned Cosmos soccer team faces possible extinctionThe sport's governing body has moved to relegate the team Pele once played for to a lower division", Crain's New York Business, September 11, 2017. Retrieved September 16, 2017. "In 2009 the NASL was revived, and the Cosmos reappeared soon after. But few attended games at Hofstra University on Long Island, and, after piling up about $30 million in losses, the Cosmos were about to shut down again last year when Commisso rescued the team and moved it to Coney Island's MCU Park, the 7,000-seat home of the Brooklyn Cyclones minor-league baseball team." ^ Ebbets Field History, Pro-Football-Reference.com. Retrieved September 16, 2017. ^ "Brooklyn Living: Brooklyn Fishing". brooklyn-living.com. ^ "Sheepshead Bay Brooklyn New York Party Charter Fishing Boat - Marilyn Jean IV". mj2fishing.com. ^ "I FISH NY Saltwater Fishing Guide for New York City Area - NYS Dept. of Environmental Conservation". dec.ny.gov. ^ Brooklyn. Tri‐State Transportation Campaign and the Pratt Center for Community Development. Retrieved May 16, 2015. ^ "Subway Map" (PDF). Metropolitan Transportation Authority. January 18, 2018. Retrieved January 18, 2018. ^ "Brooklyn Bus Map" (PDF). Metropolitan Transportation Authority. November 2017. Retrieved April 24, 2018. ^ a b Mcgeehan, Patrick (June 15, 2016). "De Blasio's $325 Million Ferry Push: Rides to 5 Boroughs, at Subway Price". The New York Times. ISSN 0362-4331. Retrieved June 28, 2016. ^ a b "New York City's Ferry Service Set to Launch in 2017". NBC New York. Retrieved May 9, 2016. ^ a b "NYC launches ferry service with Queens, East River routes". Daily News. New York. Associated Press. May 1, 2017. Archived from the original on May 1, 2017. Retrieved May 1, 2017. ^ a b Levine, Alexandra S.; Wolfe, Jonathan (May 1, 2017). "New York Today: Our City's New Ferry". The New York Times. ISSN 0362-4331. Retrieved May 1, 2017. ^ a b c "Route Map" (PDF). NYC Ferry. 2017. Retrieved July 13, 2017. ^ "Citywide Ferry Service to Launch in June 2017, Official Says". DNAinfo New York. March 3, 2016. Archived from the original on September 23, 2016. Retrieved September 22, 2016. ^ Grynbaum, Michael M. (February 3, 2016). "Mayor de Blasio to Propose Streetcar Line Linking Brooklyn and Queens". The New York Times. Retrieved February 4, 2016. ^ "Bushwick Expressway (I-78, unbuilt)". Nycroads.com. Retrieved October 24, 2010. ^ "Cross Brooklyn Expressway (I-878, unbuilt)". Nycroads.com. Retrieved October 24, 2010. ^ "Brooklyn Technical High School". Bths.edu. Retrieved October 24, 2010. ^ "Leiter's Law School Rankings". Leiterrankings.com. Retrieved October 24, 2010. ^ "About NYU". New York University. Retrieved October 19, 2012. ^ "Sam Pitroda to give inaugural address at NYU engineering school". Jagran Post. May 15, 2012. Retrieved October 19, 2012. ^ "8. Polytechnic Institute of New York University (NYU-Poly) - 24/7 Wall St.: Colleges That Guarantee the Highest Salaries - Comcast.net". Archived from the original on July 24, 2013. ^ "Schools and Colleges". New York University. Retrieved October 19, 2012. ^ "Colleges of Many Colors". The New York Times. November 5, 2006. Retrieved August 15, 2007. ^ "America's Best Colleges List". Forbes. August 5, 2009. Retrieved July 8, 2010. ^ "Baccalaureate Colleges (North) Rankings". U.S News & World Report. 2009. Retrieved July 8, 2010. ^ "Brooklyn Public Library". Retrieved October 24, 2010. ^ "Gdynia: Twin Cities". Gdynia.pl. Archived from the original on January 21, 2016. ^ "Brooklyn Borough President". Brooklyn-usa.org. Archived from the original on May 25, 2011. Retrieved October 24, 2010. ^ "BP (Borough Pres.) Markowitz joins Vienna deputy mayor to announce new "district partnership" (March 05)". Brooklyn-usa.org. March 5, 2007. Archived from the original on May 25, 2011. Retrieved October 24, 2010. ^ "Vienna in New York 2007 - (March 15, 2007)". Wieninternational.at. March 15, 2007. Archived from the original on July 6, 2011. Retrieved October 24, 2010. ^ "Brooklyn in Leopoldstadt (July 5, 2007)". Wieninternational.at. Archived from the original on September 14, 2010. Retrieved October 24, 2010. ^ "Brookdale Hospital - General Information". Archived from the original on April 13, 2015. Carbone, Tommy, "Growing Up Greenpoint - A Kid's Life in 1970s Brooklyn." Burnt Jacket Publishing, 2018. Curran, Winifred. "Gentrification and the nature of work: exploring the links in Williamsburg, Brooklyn." Environment And Planning A. 36 (2004): 1243-1258. Curran, Winifred. "'From the Frying Pan to the Oven': Gentrification and the Experience of Industrial Displacement in Williamsburg, Brooklyn." Urban Studies (2007) 44#8 pp: 1427-1440. Trezza, Frank J. "Brooklyn Navy Yard 1966–1986, the Yard was still a Shipyard not an Industrial Park"
Robbins, Michael W., ed. Brooklyn: A State of Mind. Workman Publishing, New York, 2001. Warf, Barney. "The reconstruction of social ecology and neighborhood change in Brooklyn." Environment and Planning D (1990) 8#1 pp: 73-96. Howard, Henry Ward Beecher (1893). The Eagle and Brooklyn: the record of the progress of the Brooklyn daily eagle. Vol 1. Brooklyn Daily Eagle (1898). Almanac: 1898 (2nd ed.). Brooklyn. Chisholm, Hugh, ed. (1911). "Brooklyn" . Encyclopædia Britannica (11th ed.). Cambridge University Press. Federal Writers’ Project (1940). "New York City: Brooklyn". New York: a Guide to the Empire State. American Guide Series. New York: Oxford University Press. Wikimedia Commons has media related to Brooklyn, New York City. Wikivoyage has a travel guide for Brooklyn. Digital Public Library of America. Items related to Brooklyn, various dates. ""Becoming Wards One By One" The Brooklyn Daily Eagle (May 4, 1894). p. 12.